The EKABA Foundation (KALAM Space for Fine Arts) organises and supports the International Scientific Symposium on Safety in Heritage, in which INTBAU participates as a member of the Institutional Committee. It takes place 7-9 May, 2019 in Madrid. The registration period is now open until 15 April (attendance to the symposium is free of charge). 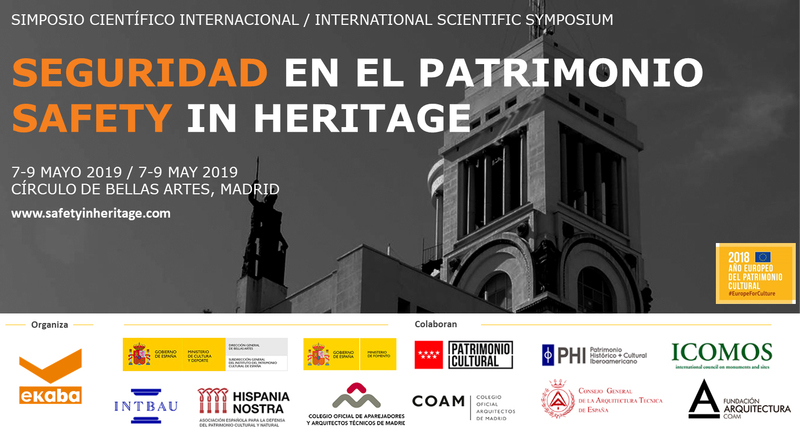 international high level speakers and El Círculo Declaration, Intervention Criteria for Safety in Heritage will be presented for debate and, where appropriate, approval. The proposal for the Symposium is structured around three main thematic sessions, one per day. These themes will define the debate during the conference and will focus on the speakers and presentations. All of which aim to set the criteria for intervention in cultural heritage, debating and searching for the best options to intervene in historic buildings, ensuring safety and avoiding, as much as possible, risks to people, both visitors and maintenance workers, while improving conservation of the cultural heritage.